Shiv Nandalall collects Sponsorship cheque from Vita Malt’s Clayton Mc Kenzie. [www.inewsguyana.com] – The Vita Malt Plus 2013 National Senior Chess Championship sponsored by Banks DIH Ltd. was launched under the VITA MALT PLUS brand on Wednesday November 27 at Banks DIH, Thirst Park. The sponsorship cheque was presented to Shiv Nandalall, President of the Guyana Chess Federation by Clayton Mc Kenzie, Banks DIH Brand Manager, non-alcoholic Malts. Eight top chess players, including defending champion Taffin Khan will employ strategy and tactics on the chess board as they vie for the coveted title, held by Khan for the past three years. Three junior chess players are also in the senior’s league with their eyes fixed on the prize. The signature tournament in local chess begins on Saturday November 30 at the OCEAN SPRAY Hotel, Stanley Place, Kitty and ends on Sunday December 8. The seven challengers who will face each other and the reigning National Champion in the single round robin tournament are: Anthony Drayton, Wendell Meusa, Davion Mars, Roberto Neto, Errol Tiwari, Glenford Corlette and Neil Khan. Each player would be allowed 90 minutes per game plus 30 seconds increment from the first move. Drayton, Mars and Neto are the three junior players who outpaced other seniors and qualified recently to enter the senior competition. Shiv Nandallal, President of the Guyana Chess Federation observed that the sponsorship is significant for the growth of chess since its resuscitation about six years ago. He extended a big “thank you” to the beverage giant for its support towards such a small discipline. Banks DIH Communications Manager Troy Peters said it is an honour to sponsor the National Chess Championship this year. “Banks DIH Limited has sponsored tournaments in Berbice, Linden, West Demerara and Georgetown as we partner with the GCF in promoting the game locally. 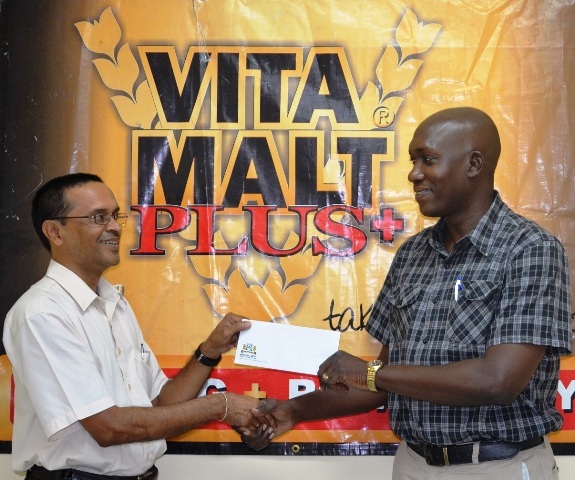 Vita Malt Plus has the right ingredients for athletes and we look forward to the chess players utilizing Vita Malt Plus as they seek excellence in the championships,” he added.